After a nearly three-hour public hearing, the City Council voted 8-1 Tuesday to approve a facility that would allow homeless people to store their valuables. 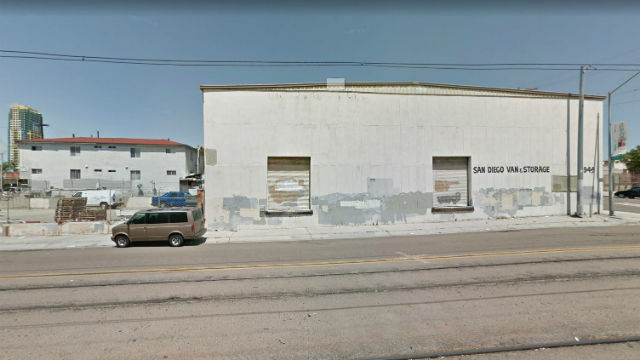 Mayor Kevin Faulconer recently proposed the Transitional Storage Center at 116 S. 20th St. on the unofficial border of the Logan Heights and Sherman Heights communities. “We can all agree there is no ideal location for facilities like this,” Faulconer said. A panel of city officials stressed there would be considerable public outreach, facility cleanliness and zero tolerance for drug or alcohol abuse, loitering or graffiti. Some changes were made to the original proposal, including reducing the number of storage containers to 500, down from 1,000, and having the facility open no earlier than June 13, after the school year ends. Clients will also be referred to the center by a service provider or currently be on the waiting list at the Think Dignity Center, a companion facility. Mental Health Systems Inc., as part of a $1,068,743 agreement, would operate the center for one year. After that period, the city Housing Authority would have the opportunity to evaluate the new center, and decide whether to continue it. According to the original agreement, Mental Health Systems would be responsible for minor maintenance and repair, 24-hour security, entering intake data into the regional Homeless Management Information Systems, coordinate with the San Diego Police Department on security issues, and provide homeless people information on other services. Councilman David Alvarez, in whose district the proposed facility will go, cast the lone no vote. He asked his colleagues to reject the proposal and made a motion to deny the city staff recommendation in favor of the center. “This proposal is a terrible idea,” Alvarez said. Alvarez added there was no community involvement and there was only one community meeting. Alvarez said there was a better location just two blocks away. Other council members disagreed, including Scott Sherman. Many people — some of whom became emotional — spoke in strong opposition to a storage facility, citing safety concerns, and possible negative impacts on both neighborhood schools and businesses. Others complained the city hadn’t properly notified them and encouraged another spot. Noel Bishop, principal of Our Lady’s School, said the 106-year-old Catholic school is located 15 feet from the proposed site. Bishop stressed that the school helps the homeless by donating clothing and staffing soup kitchens. “This is a good idea, but a bad location,” Bishop added. A first-grader at the school told council members that his fellow students can’t use the playground because it is not safe. Other students complained of having seen homeless people urinate in public or fight. Others spoke in favor of Faulconer’s proposal. Kimberly Mitchell, president and CEO of Veterans Village of San Diego, said some veterans on the street resist help because they can’t bring their belongings into a place. “We believe and trust that our law enforcement agencies will provide a better neighborhood,” Brown said.